This entry was posted on April 10, 2019 by adminuku. As some of you may know, we recently took delivery of 3 very special Ukuleles from South Dakota based Craftsman Tom Molstad. Tom's instruments caught my eye by accident about 6 months ago and I knew from the moment I saw his #13 Ukulele Shearwater that I had to own one. Half a year later and today (9/4/19) our first three piece collection arrived along with my own beauty. Bird on a Wire Instruments are so obviously committed to taking an artistic approach to instrument design; Tom set's to work building colourful and inspiring Ukuleles that test the conventional aesthetic approaches and expectations of the instrument. Each Ukulele has a name because each Ukulele has it's own voice, style, mojo, flare and substance. When you hold one, you can see it's journey and inject your music into the instruments story. Tom began his Ukulele journey three years ago and the rapid progression of his instruments both in appearance and sound is incredibly rare. We are proud to boast here at SUS that we are the first store in the world to have commissioned a collection of Bird on a wire Ukuleles. Across the three instruments; Tom has drawn influences from nature, wildlife, architecture, historical events & the world of artistic photography to produce three completely dazzling works of art. I was lucky enough to interview Tom a few weeks back whilst we prepared shipping arrangements for Shearwater, Speedwell, Flock and Crosshouse and although brief; I hope you find it interesting. 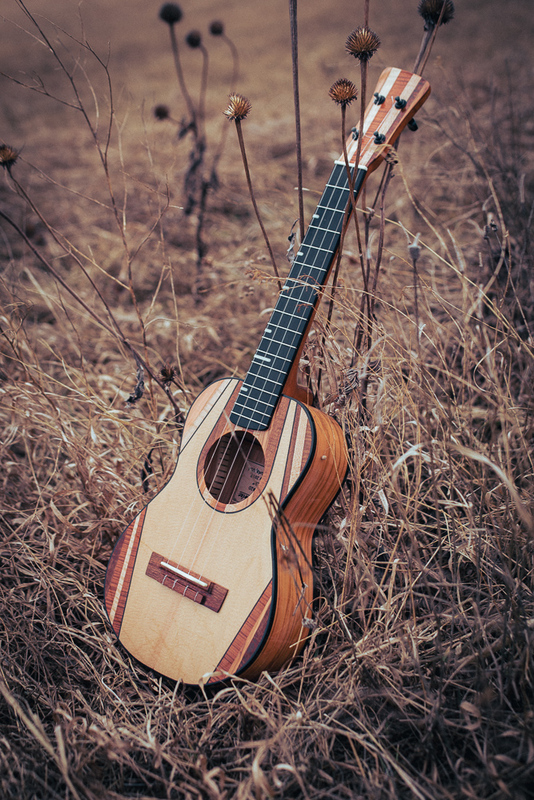 What inspired you to build Ukuleles? Mostly my love of music and I have always enjoyed watching the process of luthiers building their instruments. About five years ago I set off to learn to play the guitar and it wasn't long after that I got the bug to build my own instrument. I started with ukes because the size of the instrument lended itself to my small work space in my home. Still much to discover and learn. 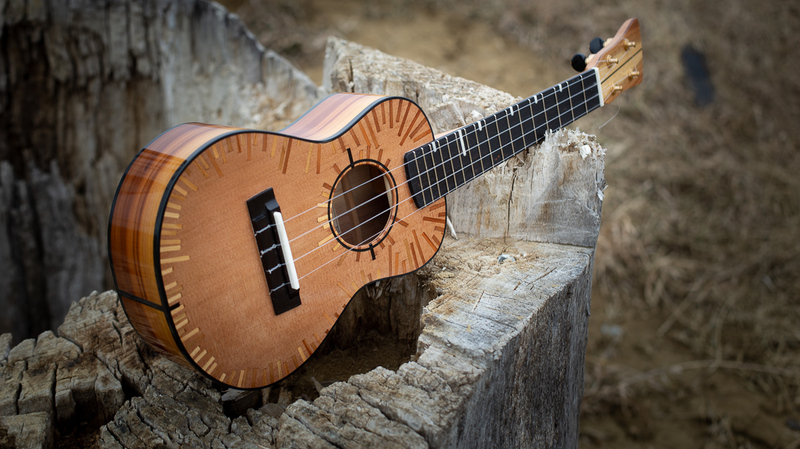 How long have you been building Ukuleles? Where did the name Bird on a wire come from? It's a nod to the fluttering right hand movements over the strings of the instrument. 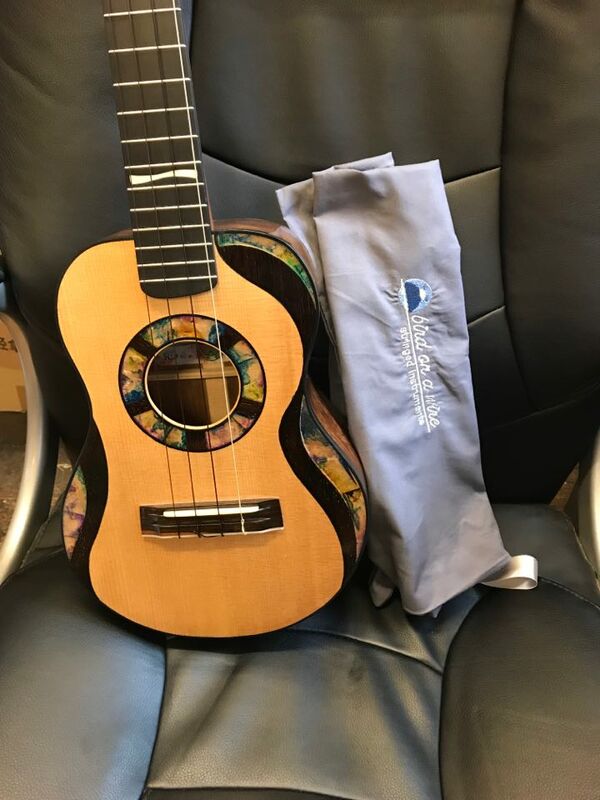 Can you tell us a little bit about the three Ukuleles you have built for us here at SUS? The Speedwell (Serial number #19) is named after and inspired by a 15th century ship that sailed alongside the Mayflower. The design was created with the desire to inlay different sustainable media in new and creative ways. The glittery effect inlayed throughout the soundboard of the instrument is tiny pieces of hand dyed Mica stone and the design echoes the outline of the instrument using the dyed stone mosaic and hand shaped walnut. I had this idea in my head for quite some time before you guys came along and we discussed some designs for your builds. 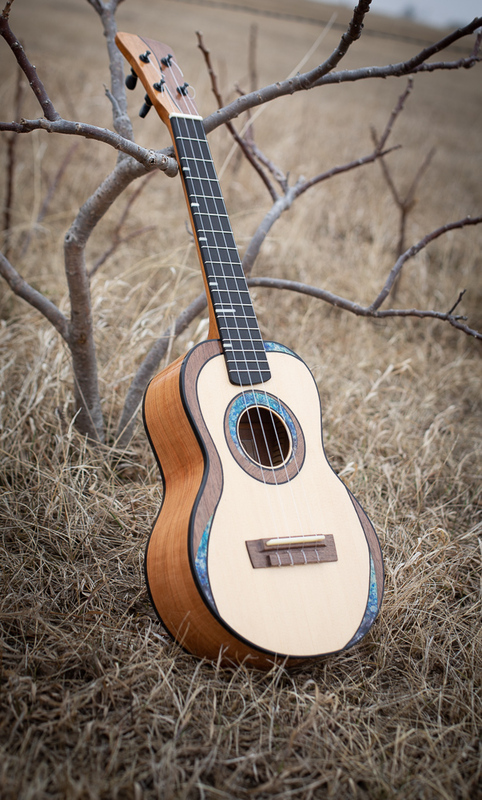 The main design of this Tenor uke centred around a desire to create a non traditional inlaid rosette that connects the end of the body and the soundhole in a flowing motion. The outer edges of the design slowly walk towards meeting the middle... my favourite part is managing to incorporate some really nice Hawaiian Koa into the Ukulele. Also, its just a small thing but Olive is great - when you're working on it there is a lovely smell that fills the room. The Crosshouse drew influence from Itchen Ferry Village which was not far away from you guys in Hampshire. The Crosshouse is named after a shelter located in the area that you can find with a simple Google search. Working from an image of the Crosshouse, I loosely recreated the shape on the top of this Ukulele. The top takes its queue from the straight lines of the crosshouse and nature creating that graduated crossing and switching in colour on the inlay. The back and sides are Plum which has a fantastic colour palette of its own. You don't see much Plum used in instrument building on larger instruments due to the trees small girth but the Concert is the perfect size to utilise this tonewood. What is Baltic, South Dakota like? It's not the most common place for us to discover a Ukulele builder. I live with my family on a small country acreage not far from the community of Baltic, SD. It's a picturesque farming area with rolling hills and a creek flowing not far from us. Really inspiring countryside. Do you have a favourite Ukulele? Either one you have built so far or one that inspired you in some way? Not a particular instrument, but I'm inspired by watching the builds and craftsmanship of luthiers like Michael Thames, Pablo Requena, Ben Crow, Tomy Hovington and Ad van Kuijk. So there you have it... I really hope SUS can play our part in creating more fanfare for Tom's fantastic work. The Ukuleles have clear and inspired designs and sound fantastic. The finish is a bit rough and ready - sure - but that didn't stop me from jumping at the chance to own a Bird on a Wire Ukulele and I hope that after seeing them for yourselves, you might jump at the chance too. Please do take some time out of your day to watch the video Phil and I have made about these Ukuleles.